Between my work schedule and commuting, I am always looking for ways to cut down on dinner prep time, including by using the slow cooker. But most slow cooker recipes that I had seen before are very meat-intensive- this book provides several intriguing Indian recipes that fit the bill, primarily Vegetarian recipes. The recipes that I have tried so far have been delicious, healthy, and economical- they rely heavily on dried beans and lentils. 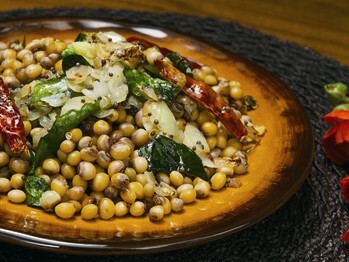 Many of them require additional side dishes of vegetables or breads to make them a complete meal. One note to mention if you are cooking for one or two. The recipes are scalable (and most are designed to feed a crowd)- but to successfully scale down the lentil and bean recipes, you need to use a smaller (3 quart) slow cooker- otherwise the lentils and beans don't cook properly. I usually cook for two, and personally only own a standard-sized slow cooker, so my work around has been to freeze leftovers. Subbed potatoes and tofu for the chicken. Added potatoes at the beginning of cooking time. Dry-fried tofu on two sides and then added to slow cooker in the last hour. Overall I thought this was quite good, but I do think the cooking time is a touch too long. I went for about 7 hours and that was plenty. The result is chicken that is falling off the bone with a very nice sauce redolent with the spices and with a bit of a bite, but not too much. 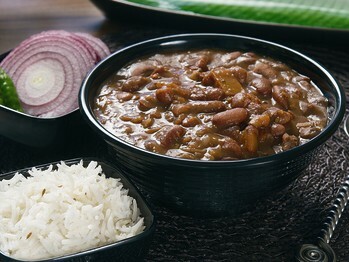 I was trying to replicate the Dal Makhani I had often in India recently. The flavor of this was spot on - however, it was way, way too thin. 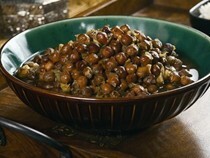 I would try this again using only half or so of the water called for to cook this in the slow cooker. The cream is definitely necessary to get the flavor and body of the dish I had in India. 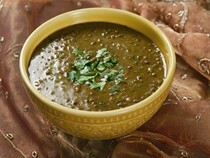 This is a basic slow cooker recipe that can be turned into Dal Makhani by adding cream and butter at the end- although I found it wasn't necessary because the lentils really break down. I would cook this again for a dinner party when I want to serve multiple Indian dishes, because you can just put this on and forget about it until you are ready to serve. This is a good one for using up those smaller amounts of leftover dried beans and lentils you may have on hand, which are otherwise hard to purpose. This comes out like an Indian-spiced all bean chili- I served it with the hoppers from the Essential New York Times Cookbook. You can add the heavy cream and yogurt at the end as the recipe calls for, but I didn't think the heavy cream was needed (so didn't use it), and I liked the yogurt better dolloped on top. Easy and so tasty. Definitely a keeper. I had a bunch of fresh curry leaves on hand so decided to make this. 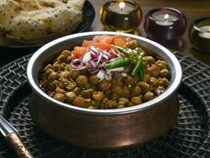 It's one of the best dal recipes I've tried, and I've made many. It's heavy on cumin, so if you don't like cumin you won't like this. I used light coconut milk and didn't miss the extra fat. Wonderful recipe, I've made it a few times. I cut down on the chilis, it's VERY spicy if made as written. This is wonderful. I followed the recipe as is and served this most delicious vegan curry over brown basmati rice. Yum! 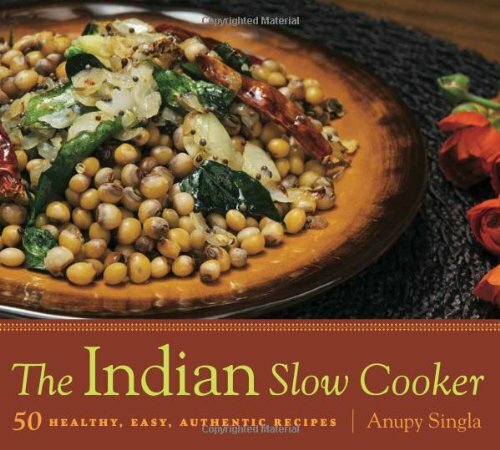 In 50 well-crafted and imaginative recipes, Anupy shows you how to use the modern slow cooker to get the beautiful, complex flavors of her ancient native cuisine. A book that will surprise you. This unique guide to preparing Indian food using classic slow-cooker techniques features more than 50 recipes, beautifully illustrated with full-color photography throughout. These great recipes take advantage of the slow cooker's ability to keep food moist through its long cooking cycle, letting readers create dishes with far less oil and saturated fat than in traditional recipes. Anupy Singla shows the busy, harried family that cooking healthy is simple and that cooking Indian is just a matter of understanding a few key spices. Her "Indian Spices 101" chapter introduces readers to the mainstay spices of an Indian kitchen, as well as how to store, prepare, and combine them in different ways. Among her 50 recipes are all the classics — specialties like dal, palak paneer, and gobi aloo — and also dishes like butter chicken, keema, and much more. The result is a terrific introduction to making healthful, flavorful Indian food using the simplicity and convenience of the slow cooker.